We take a look back at some of the most unforgettable fashion trends of 1999. Twenty years ago, in 1999, bucket hats and denim-on-denim were all the rage. Could we forget these trends? To quote "Clueless," "Ugh, as if!" Let's take a look back at these unforgettable styles. A fashion staple in 1999, this simple accessory could help you rock any outfit. Let's face it, we all wanted to "spice up our life" like Mel C in her stylish athletic wear. There's no better outfit than one that's trendy and comfy. (Mitchell Gerber/Corbis/VCG via Getty Images) Jennifer Lopez in New York City. This was a go-to look for celebs on the red carpet. Everyone from J.Lo to Christina Aguilera loved this fun makeup trend. We will always have a special place in our hearts for matching boy bands. (Getty Images) Gap Outlet retail display. Every '90s kid begged their mom for that classic branded hoodie from stores like Gap or Old Navy. It was a closet essential for a laid-back look. (Mirek Towski/DMI/The LIFE Picture Collection/Getty Images) Cast of television series Friends: (L-R) David Schwimmer, Jennifer Aniston, Courteney Cox, Matt LeBlanc, Lisa Kudrow and Matthew Perry at Screen Actor's Guild Awards. The '90s proved that bandanas were not just something to wear on your head. They were also the inspiration behind one of the biggest styles for tops. (Larry Marano/Getty Images, FILE) Britney Spears goes shopping at Walt Disney World in Orlando Fla., June 15, 1999. This was the accessory we never knew we needed until 1999. It was the coolest way to stay out of the sun. This look lives on to this day, but it wouldn't have been possible without those iconic denim-on-denim moments in 1999. Who can make it more chic than Heidi Klum? An essential in a dude's closet. We were clueless for loving baggy trousers. (Jim Smeal/WireImage via Getty Images, FILE) Members of Destiny's Child are pictured on Sept. 03, 1999, from left, LeToya Luckett, Beyonce Knowles, LaTavia Robertson and Kelly Rowland. This red carpet trend gave new meaning to the term "squad goals." 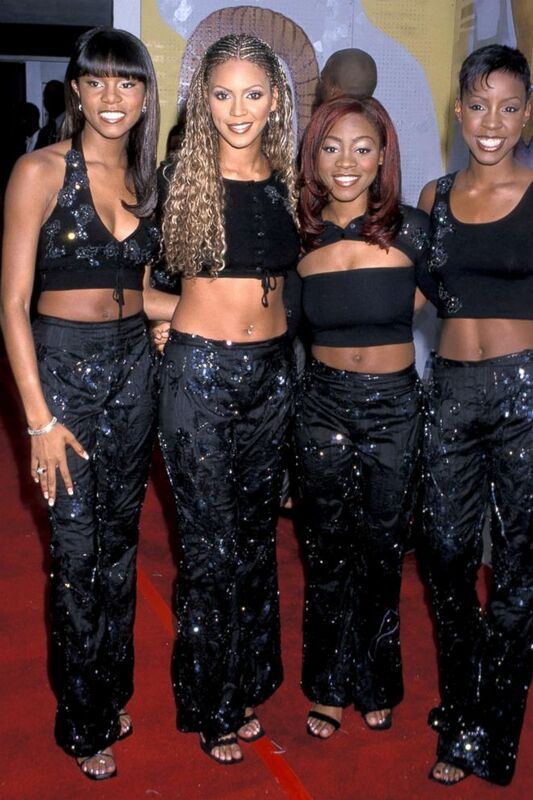 Exhibit A: Destiny's Child, the group that everyone wanted to dress like.